Be careful for what you ask for, You just might get it. OK…a couple of you asked for it, but now you’re going to get it. As I mentioned last week, One Take Only is not dead – though a few of you probably wish it was. For the uninitiated, One Take Only is the original videoblog of Oilpressure.com. It is unrehearsed and unedited. We start the camera and just start talking. If we flub, you see it – hence the name. It features myself and my longtime friend, John McLallen. John and I have known each other for about twelve years, and then worked together from 2010 to 2017 when my job was outsourced and his was not. While we still worked in the same building in or same offices, we had different employers. John is one of the few IndyCar fans I know locally. For the first year we knew each other, it was strictly a professional relationship. Then one day, I was in his office and saw a Mario Andretti helmet, an AJ Foyt Coyote and a Jim Clark Lotus all on display. We started talking IndyCar and a friendship blossomed. 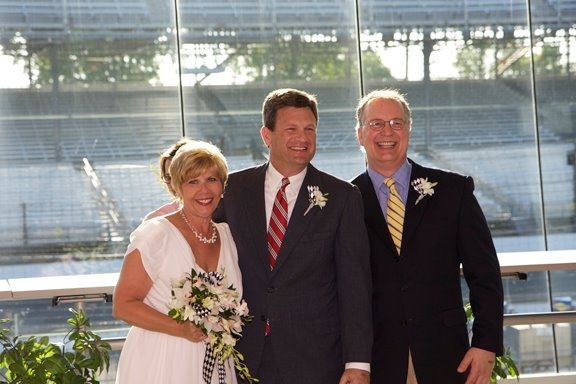 When Susan and I got married at IMS in 2012, John was my best man and Paul Dalbey took our wedding photos. A fun time was had by all. Like any good friends, our friendship has had its ups and downs. Things went south in 2018 for a variety of reasons, some of which I’m still not sure of. But when I made fun of him re-painting his green chair from IMS on the last episode we did last May, he didn’t like it at all and claimed that I set him up. I guess I did, but I thought it was in fun. It was not taken as such. To be fair, John has a lot on him right now. Three years ago, his identical twin-brother was diagnosed with prostate cancer. The disease has now progressed and John realizes things don’t look good. We all handle grief in different ways. When my father was dying in 1994, my sense of humor got me through it. I am also the one that tends to want to tell jokes at funeral home visitations. I’ve tried to subdue that trait of mine, but it invariably comes out – usually at the most inappropriate times. While it works for me to deal with my own grief, most people don’t appreciate that approach. John is one of them. But there have been things that were most decidedly my fault, that turned our friendship south. Most here know how much I cherish the moment when (Back Home Again in) Indiana is performed just before the start of Indianapolis 500. In 2017, Jim Cornelison was chosen to sing it after two less than stirring renditions were performed after the retirement of Jim Nabors. For months, John had heard me talk about how much I was looking forward to that moment. John bought my brother’s tickets that year and he and his teenage son happened to be sitting with me. Just as the Purdue All-American Band gave it’s intro for that magical song, John broke out in song and began singing along loudly, in a voice that mimicked Bill Murray’s drunken Nick the Lounge Host character from Saturday Night Live. I immediately told him “No! You’re not doing that!” He grinned and proceeded to continue in an even more exaggerated way, as if I had asked him to please do it more. At that point, my temper took over and I lost it. I went into a tirade where I really have no recollection of what I exactly said, but I know it was laced with more than a few F-bombs. We barely spoke throughout the race. Susan had no idea what was going on. She snapped this photo of us during a caution period, as we were gritting our teeth instead of smiling. Even though we saw each other at work every day, we went over two weeks without speaking to each other. He had ruined my favorite moment of the Month of May and I was mad about it. Some of you will understand that, while others won’t. Somehow we got back on speaking terms and things seemed normal for a while. But after my job was outsourced later that summer, it seemed that everything I said offended him. You’d think I was the one that should’ve been on edge. 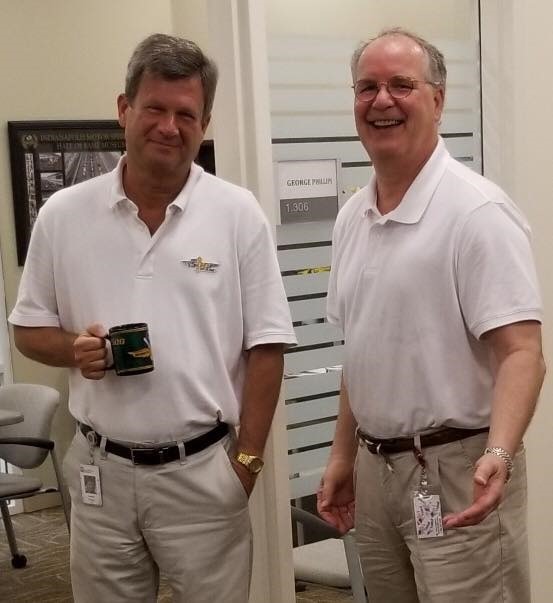 Last summer, a co-worker snapped this photo of us standing outside my office, because she thought it was funny that we were both wearing white polos and khakis. John was in a more affable mood that day than I was. Last August, it all hit the fan. Things got so bad between us that our former boss (and very good friend to both of us) had an intervention between the two of us in my office. It was there that it came out that John was still harboring a grudge because I had cussed him out (loudly) in front of his son a year and a half earlier. I had no idea he was still holding on to that. It apparently upset him much more than I realized, but it festered within him and he lashed out at me periodically without me having a clue as to why. It made for a very tempestuous friendship. I’m not proud of the fact that things had gotten so bad between us at that point that I couldn’t bring myself to apologize. Instead, I said a few things in that intervention that I now regret and he said a few things that he probably regrets as well. In October, John was moved out of our building (for reasons unrelated to all of this) to a location across town and we no longer see each other regularly, which was really a good thing at the time. When I got word around Christmas that his brother’s condition had worsened considerably, suddenly none of the foolishness between us seemed important anymore. Sometime in January, we met for lunch and buried the hatchet. For the record, I now freely admit that I was wrong to cuss John out in front of his son regardless of the circumstances. In case I come off as trying to cast most of the blame on John, I accept just as much of the blame as John should. Like most disagreements among friends, we were both wrong. Add in the pressure of the deal with John’s brother, and well…you get the picture. I had the right to get mad, but not that mad. Once the apologies were out of the way, I asked John if we were going to do any more episodes of One Take Only. He said yes, but I could tell he really meant maybe, at best. So I got to thinking about a Plan B. Paul Dalbey had just launched his new site, Field of 33, and I was thinking if John doesn’t come back – maybe Paul and I could do something similar, albeit remotely through Skype. The first episode of our new venture, Two Sites Unite, was posted this past Friday. I don’t think John was very happy to see it. He says he watched some of it, but didn’t think it was very good. Granted, it was our first time and it’s a work in progress – but I didn’t think it was that bad. So this past Monday afternoon after work, John and I met at our usual spot in my backyard to do our first One Take Only in almost ten months. It was a little awkward, but it was also very therapeutic. It felt comfortable – except for the fact that it was 29° as we were taping. Some ask why we always do these outside. It’s simple. The lighting is much better out there than inside my house. 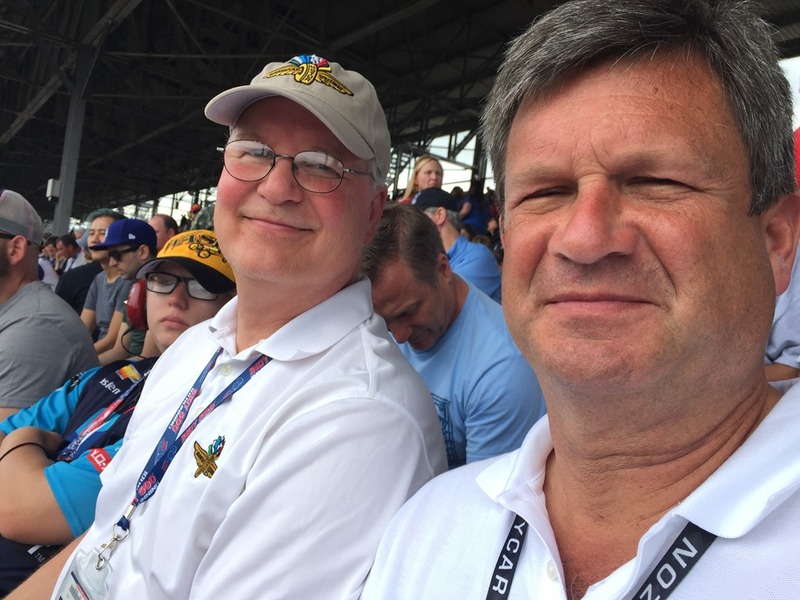 I now have two IndyCar videoblogs that I‘m involved with, and I enjoy them both – though they are both very different. One has been going for less than a week, while the other has been going for almost eight years. While they will not be that frequent, they will both be popping up here from time to time. 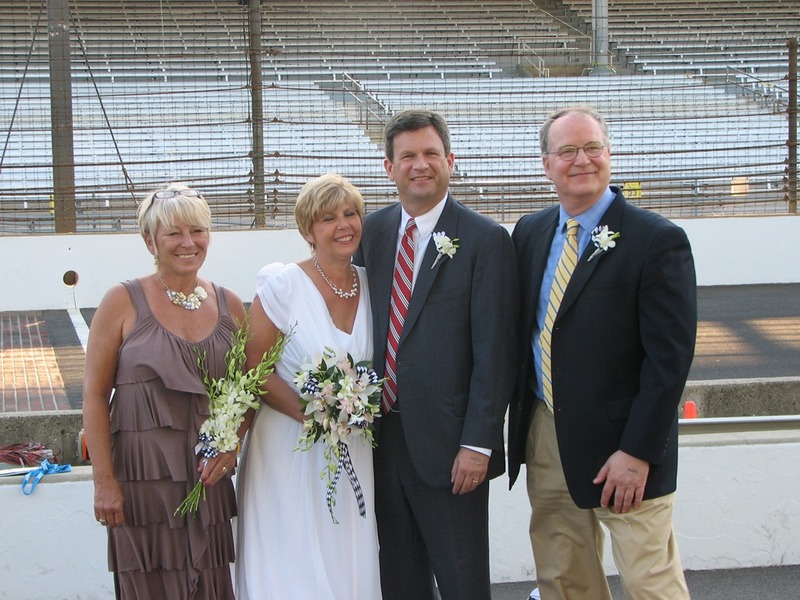 I compare my friendship with John to that of Tony Kanaan and Helio Castroneves. We are very close friends who both know each other so well that we can complete each other’s sentences. But we also exasperate each other. He can get on my last nerve without even trying; and as hard as it is to imagine, I apparently get on his nerves too. Maybe it’ll be more like The Eagles. Glenn Frey forgave and forgot all of the animosity between him and Don Felder when The Eagles got back together fourteen years after their meltdown. But after a while, the scabs came off of the old wounds and it got really ugly again between Frey and Felder, resulting in Felder’s permanent exit. I’m not sure if they ever patched things up before Frey’s untimely death in 2016. I’m hoping it goes more like TK and Helio, who seem to have successfully patched up their feud from about a decade ago. So hopefully, this new episode is the final piece of the puzzle to restoring our friendship back to where it was a couple of years ago before I blew up at him. Either that or me writing this long, revealing and drawn-out explanation may be the final blow and this will be the beginning of the end of our friendship. If you see no more episodes of One Take Only beyond this one, you’ll know why. So with that, please enjoy the return of One Take Only. This entry was posted on March 6, 2019 at 4:03 am and is filed under IndyCar. You can follow any responses to this entry through the RSS 2.0 feed. You can leave a response, or trackback from your own site. Glad you guys patched things up. In any long-lasting friendship there will be occasional issues and arguments but it’s good you were able to talk it out and work it out, even if the circumstances surrounding it are less than pleasant. Thank you gents for the video, I look forward to more! If Uncle Bobby can make it up with Mario after 37 years, I’m sure the ‘One Take Only’ guys can do more episodes. Thank you for your comeback video, guys. Thanks for being open and honest about what happened. I’m glad that John is alright. Sorry to hear about his brother, though. Best wishes to him. Great to hear you both again! I have always enjoyed these videos, two friends shooting the breeze about IndyCar and am glad to see you guys back together and doing them. I found Two Sides Unite enjoyable from a racing nerd (interest in the particulars of the sport) perspective, but One Take Only is really fun from the racing fan (watching with rooting interest) perspective. I think it’s great you guys made up. True friend is hard to come by.